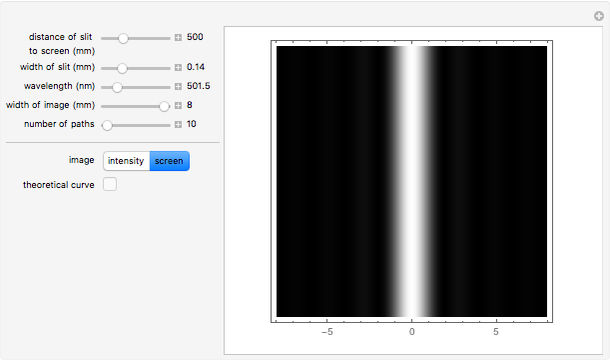 This Demonstration investigates how the different parameters influence the image of the diffraction. The calculation of the intensity is based on Feynman's method of "integrating over paths". You can observe how the number of paths changes the intensity and can compare it with the theoretical curve of Fraunhofer diffraction. For a large aperture, for example 0.5 mm, there are large differences between the calculated curve and the theoretical curve, because the diffraction is not a Fraunhofer but a Fresnel diffraction. 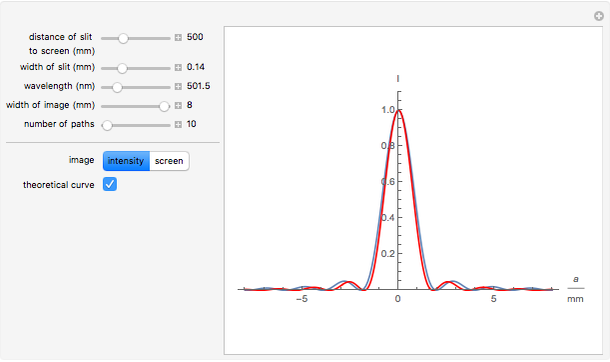 The image can show the graph of the intensity or a density plot that resembles the image seen on a screen in a real experiment. For this setting the maximum number of paths is limited to 20 in order to get a faster response. R. P. Feynman, QED: The Strange Theory of Light and Matter, Princeton: Princeton University Press, 1985. Hans-Joachim Domke "Single-Slit Diffraction Using Feynman's Method"